Click on the topic(s) below to read about valuable "First Time Cruisers" information! Why haven’t I received my luggage yet? Most cruise lines ask that you be patient the first few hours after sailing as it takes time to distribute the luggage. To help ensure delivery, be sure the tags on the luggage are correctly filled out. Also be sure to keep anything with you that you may need within the first few hours of sailing (such as medication). The dress on the first night is typically more casual as many lines understand that not everyone has their luggage yet. We have twin beds and wanted a double! 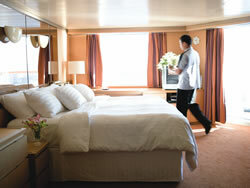 Most cruise ships are outfitted with beds that can be split to make twin beds or pushed together to make a double bed. Just call your cabin steward and ask them to reconfigure the bed. He/She will be happy to take care of it for you. How do I get a reservation at a specialty restaurant? Book your reservation either prior to sailing or immediately upon embarkation. Some cruise lines have gone to limiting guests to one visit because of the popularity. There is an additional charge to help cover the wait staff’s tip but it is generally well worth it! The shore excursion I want is sold out! Shore excursions are on a first-come, first-served basis. If you find one that you want, try to book before sailing or be waiting in line as soon as the excursion desk opens. Some lines may offer a waiting list. The ship missed a scheduled port on the itinerary. Will we be reimbursed? The fine print of your cruise contract will tell you, no. Cruise lines will do everything they can, but if the ship, staff, and guests are in danger, they will not risk pulling into a port. They may try to find another port that is available to make up for the missed port. We requested first seating at dinner, and got second! Dinner seating requests are filled on a first-come, first served basis, so the earlier you book a cruise, the more likely you are to get your request. First seating generally fills up faster than second. On many lines, you can visit the maitre d’ upon embarkation and request to be switched. The maitre d’ will do everything he can to honor requests, but please know you still may end up with the original assignment. Cruises offer an incredible dining experience. Many cruise lines work with world famous chefs to prepare a menu for you that is like no other. A cruise is a great time to try new dishes that you wouldn’t normally eat. If you don’t care for it, your wait staff will be more than happy to exchange it for you. You are free to order multiple dishes if you can’t decide on just one. Depending on the cruise lines, there are several different options available for dining. If you are unhappy with your option of dining, visit the Maitre d’ soon after boarding the ship. They will do their best to meet your requests and ensure that you have a pleasant dining experience. Dinner is typically served at two different seating's. The first seating is generally around 6:00 pm and the second seating around 8:15 pm. Each person is assigned a table that you sit at each night. You are served in elegant, comfortable dining rooms and are served by the same wait staff each evening. All dinner seating's are on a request only basis and are assigned on a first come, first served basis by the cruise line. First seating tables generally fill up faster. The earlier you book a cruise, the more likely a request for first seating will be met. First seating may be best for you if you are traveling with small children, you like to go the bed between 10:00pm and midnight, or if you are an early riser. Second seating may be best for you if you don’t want to feel rushed for dinner after a day in port. Night owls and those who love late night social activities generally prefer second seating. If you don’t mind finishing your meal around 10:30 pm, then second seating is for you. When you book your cruise, you will be given a choice between a small, medium or large table at dinner. A small table seats 2 - 4 guests; a medium, 6 - 8 guests; and a large table seats 8 - 10 guests. The cruise line will then do their best to seat you with passengers in a similar age group; families with other families, singles with singles and honeymooners with other honeymooners. Lifelong friendships have been made between total strangers who shared a table during their cruise vacation, so the dining experience is a great way to meet new people from all over the world. In the unlikely event you don't enjoy the company of your table mates, you can request to be moved to another table. Just speak with the maitre d'. They'll make every effort to seat you with more compatible dining companions... discretely and politely. On most cruise lines, you will be in the same restaurant the entire cruise. On others, like Disney Cruise Line, you rotate through different restaurants still eating at the same time. Your same wait staff will serve you in each of these restaurants. Some cruise lines offer more flexibility when it comes to their dining schedule. The dining room will be open during certain times during the day and guests are free to come and go as they choose much like you would in a casual restaurant on land. You are served by a different wait staff each night. You are free to enjoy dinner alone or with friends, the choice is yours. This option of dining may be offered as an alternative to the traditional style on the same cruise ship or may be the only option available. Specialty reservations-only restaurants are perfect when you want a dinner for two without the kids to enjoy each other’s company. The restaurants range in various themes from Italian, Chinese, Japanese, or Southwestern cuisine. 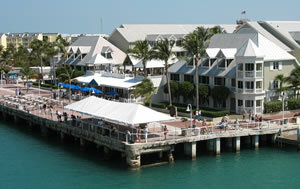 Additional charges ranging $10-$40 per guest may be applicable depending on the ship and the restaurant. These restaurants book up quickly so be sure to make your reservation as soon as you board the ship or, if possible, before you go. Buffets on cruise ships offer an alternative for breakfast, lunch or even dinner if you don’t want to go to the dining room. Some buffets are open 24 hours and some only during certain times during the day. If you don’t want a full meal at dinner time or are looking for that meal served between lunch and dinner, there are several options available that vary from ship to ship. Burger and hot dog grills, ice cream bars, pizzerias, plus many other shops and options. Be sure to watch for extra charges before you order the delectable pastry in the coffee shop. Some of the specialty shops such as the pastry and coffee shops may charge an additional cost. There are plenty of options that don’t cost anything. Got a craving in the middle of the night? 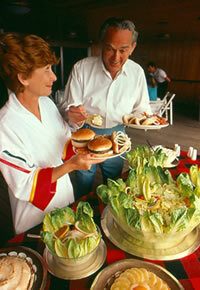 Room service on a cruise ship is available any time of the day or night at no additional charge except for gratuities. You can opt to have breakfast in bed by filling out and placing a breakfast card on your door the night before. 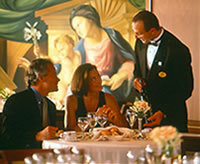 Several cruise lines offer additional dining experiences. You may have the option to enjoy a romantic dinner or breakfast on your private balcony. Indulge in specialty midnight buffets like a decadent chocolate buffet where everything is made of chocolate, even the sculptures on the tables. You can eat all day and into the night if you choose to! Cruise tipping is often very confusing especially for first time cruisers. Many staff members expect and deserve gratuities for their hard work. Some cruise lines may even discourage tipping or charge a service charge instead of expecting tips. How do you know who, when, and how much to tip? No tip is ever required. It is an expression of thanks for service that is provided. 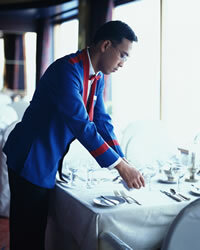 Gratuities, however, are often part of the wage for the staff onboard. Cruise lines generally suggest an amount per day to tip for each staff member for each person in your family/ group. It is the discretion of individual guests whether that amount is sufficient for the service that was provided. Guests traditionally leave tips on the last night of the cruise. Envelopes are generally left in your cabin for you to give to the respective staff member or they can be picked up at the Purser’s Office. You can pay gratuities by using cash or by adding it to your onboard account. The Purser’s Office will add the gratuities to the account and will give you a coupon to put in the envelopes. (Lines for this will be long at the end of the week, so try to take care of it early in your cruise.) Gratuities are given to the dining room staff during your last dinner with them. Envelopes with gratuities are left in the cabin for your cabin steward or handed to them directly. Most cruise lines will suggest amounts in pre-departure information and in your cabin one night during the cruise. New trends allow you to prepay set amounts by credit card before embarkation. Even with prepaying, you will need to give the staff an envelope with a coupon. You will receive the envelopes and coupons in your stateroom sometime during your cruise. Bartenders are in a different category. Most lines automatically include tip in the bill so additional gratuity isn’t necessary unless you want to. It is always good to have a stack of dollar bills with you during your vacation. A couple of dollars per visit is acceptable for the room service stewards. (Some cruise lines allow you to charge a tip for room service on your onboard account.) Baggage handlers/ bellmen/ porters generally receive one dollar per bag. Recently, the trend is moving away traditional tipping. Instead, some cruise lines are implementing a service charge. Guests from Western Europe and the Far East are not accustomed to tipping but will expect a service charge to the bill. Many lines are also moving to alternate or free choice dining options with a different wait staff each evening. This makes tipping a problem. Tipping will still be expected in these lines for services that not all guests use such as the spa or bar services. Tips are a good way to say thank you for the service provided, it should always be accompanied by a verbal or written appreciation. One of the best ways to say thank you is to mention a particular staff member who made your vacation special in the end-of-cruise questionnaire. Those comments are often shared with them. Below are some of the major cruise lines and their guidelines on gratuities and/ or service charges. Reverse Gratuity Policy: The recommended gratuity amount is added to the onboard account on embarkation day. Guests have the discretion to adjust levels during the cruise. Pre-Paid Gratuity Policy: Gratuities are pre-arranged and paid at the time of booking or any time up to two weeks prior to the sail date. Guests have the discretion to adjust levels during the cruise. Tipping the Maitre D’ is at guest discretion. A 15% gratuity is automatically added to beverage purchases. Tips for the Maitre D’, headwaiter, assistant stewardess and night Room Service personnel are at guest discretion. Gratuities may be prepaid or charged to shipboard account. Gratuities are suggested at $7.00 per guest, per dinner at the specialty restaurants (Prego, Jade Garden, Silk Road, and The Sushi Bar). A 15% gratuity for all bar drinks and wines is added automatically. A 15% gratuity is suggested for Crystal Spa & Salon services. Tipping is neither expected nor required for Cruise West Staff, on land or at sea. Recognition for exceptional service is discretionary and guests are welcome to tip individuals directly. Gratuities for the dining manager, room service, Vista Spa & Salon, and shore excursions are at guest discretion. Gratuities are included at the specialty restaurant, Palo. Gratuity is not expected for babysitting services. 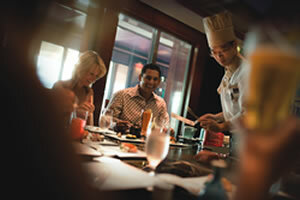 A 15% gratuity charge is automatically added to bar, beverage, wine, and deck service tabs. All gratuities can be charged to your room charge. Charge a Hotel Service Charge of $10 per passenger per day. Guests are free to adjust the amount at the end of the cruise if service exceeds or fails to meet expectations. A 15% service charge is automatically added to bar charges and dining room wine purchases. Charge a fixed service charge of $10 per person, per day to onboard account. For children ages 3-12, there is a $5 per person, per day charge with no charge for children under three. Guests are encouraged to bring problems to guest relations. In the event that an issue cannot be resolved, guests have the ability to adjust the service charge. Staff members are permitted to accept a cash gratuity if a guest feels like they “go the extra mile.” Certain staff positions provide services on an individual basis to some guests. Guests are encouraged to acknowledge good service from these staff members with appropriate gratuities. Recommended gratuity for bar services is 15%. Guests are charged a Hotel and Dining charge of $10 per passenger, per day (including children) to onboard account. The charge is shared by the wait staff, stateroom stewards and accommodations staff, buffet stewards, galley staff, laundry staff and others. Casino dealers and Lotus Spa personnel do not share in the Hotel and Dining charge as not all passengers utilize these services. A 15% gratuity charge is automatically added to bar charges and dining room wine account. Gratuities are not expected on board as they are included in your cruise fare. A 15% gratuity will automatically be added to bar bills or wine check when served. Pre paid by having them added to your reservation by your booking agent. Added to your onboard SeaPass account. Tipping is neither required nor expected as it is included in the price. Prices do not include gratuities for local shore excursion guides, drivers, and related service staff. Independent, subcontracted ground operator companies employ all ground staff and these entities do not participate in Seabourn Cruises’ on board "no tipping" practice. Tipping of guides, drivers and other independent ground staff is at the individual guest’s discretion, anticipated and appreciated. Charge a Hotel Service Charge of $11 per passenger, per day. Guests are free to adjust the amount at the end of the cruise if service exceeds or fails to meet expectations. A 15% Beverage Service Charge is automatically added to bar charges and dining room wine purchases. Indulge in the pampering and luxury that you deserve. 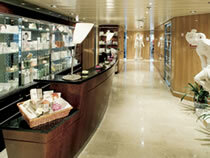 Cruise ship spas and salons are the most luxurious and relaxing place on the ship. Reminiscent of famous land-based spas, you can book everything from facials to massage therapy to body wraps to salon services. Can you imagine your afternoon? Relax with a therapeutic massage while listening to calming music. Then head over to the salon to prepare for formal night with a hair appointment, manicure and pedicure. It is the life you have always dreamed of! Whether you’d rather spend your days in a deck chair soaking in the sun or trying your hand at the rock climbing wall, everything you need is found on a cruise ship. Many ships offer multiple pools. Sometimes those are reserved for certain groups like an adult only pool. Some ships even have water slides or surfing simulators. Cruise lines may offer enrichment classes from everything to learning a foreign language to learning the secrets of the chefs onboard. Take a beginner's class in piano. Learn about the art of animation or how to make those cute little towel animals. Classes vary by cruise ship. Be sure to check your daily newsletter to see what is being offered each day! Live entertainment is not hard to find on a cruise ship. Enjoy a Broadway or Vegas style show in the ship’s theater with the latest in audio and lighting equipment and special effects. Be mesmerized by elaborate costumes, beautiful sets, amazing voices, and intricate dance moves. Laugh along with a comedian. Watch the amazing acts of a ventriloquist or juggler. Listen to the beautiful sounds of a jazz musician or concert pianist. Dance to the music of a Calypso band. The live entertainment varies by the individual sailings. Many cruise ships have a casino. These elaborate rooms are decked out with all kinds of games and slot machines. Try your luck at roulette or blackjack. Experience the excitement of winning at a slot machine. Many cruise lines offer classes for beginners and pros if you want to brush up on your game. This is your chance to experience a Vegas style atmosphere! Do you crave the night life? Cruise ships come alive as the sun sets. In addition to the live entertainment, you can be sure that you will not be bored at night. Sip cocktails in the lounge before (and if you want, after) dinner. Sing your favorite song in the karaoke lounge or at a sing-along piano bar. Dance the night away in the many night clubs. Need some time away from the crowds but don’t want to go the stateroom? There are plenty of areas available on your cruise ship that allows just that! Cruise lines offer well-stocked libraries with books for every taste. Relax in a leather chair surrounded by books. You can also play a game of chess or bridge in the game room. Check out the movie theater for first run movies. Head down to the coffee bar for that cozy, quiet atmosphere. You might even find a quiet corner to take a quick nap! Want to feel the excitement of feeling stingrays rub against your leg? How about a zip line adventure through the rainforest canopy? Do enjoy sight-seeing excursions? Are you looking for the party scene? Find your adventure with a shore excursion, one-day tour offered in various port cities. 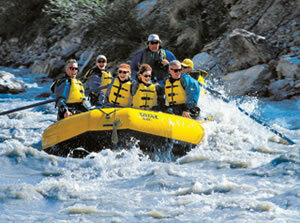 Whatever your idea of adventure or entertainment is, there is something for you to do in each exciting port of call. An excursion is a great way to enhance your cruise experience and to see so much more of the ports during your cruise. The key to getting what you want is to book early! Some cruise lines allow for guests to reserve shore excursions online prior to departure. If you don’t or can’t book online, be sure to get to the shore excursion desk as soon as it opens on the ship. Popular shore excursions sell out fast! Be sure to read any fine print before signing up. Cruise lines vary on their policies of changing or canceling an excursion. You may choose to explore the port on your own. Due to several factors, this is easier to do in some ports than others. Factors may include poor roads or driving conditions, the number of tourists, or a lot of hassle and planning on your part. In these cases, a shore excursion from the cruise line is the best way to go. When exploring on your own you may miss the narratives of the history, culture, or interesting tidbits, but you may discover other attractions on your own. Touring alone allows you to connect with the destination in a more personal way. It is important to know exactly when your ship departs when going alone. You will be responsible for getting yourself back to the port. The ship will not wait for you! If you are on a shore excursion organized by the cruise line, they are responsible for getting back on time. Port cities are exciting destinations, but can sometimes be intimidating, if not downright unfriendly, places. No matter where you are, it is important to just be prepared. Know what to expect and how to deal with it and just use common sense. Always take your passport onshore with you, carrying in a secure bag (across the shoulder with bag in front or under the clothing style money pouch). Don’t leave your camera or bag in a chair at the restaurant. Keep it in your lap. Don’t dress to stand out, but to blend in. The tropical shirt and the camera around your neck is a great clue that you aren’t a local! Safety is found in numbers. It’s never a good idea to venture into unfamiliar areas on your own. Your cruise director will generally give a talk about each port prior to disembarkation. You will learn valuable information about everything from safety to shopping venues to great places to eat. Try to ensure that at least one member of your group attends this discussion. Don’t let fear of the unknown prevent you from exploring the exciting and interesting destinations of the world. Do your research and know about your destination so you can explore safely and with confidence. The cruise lines want to help you celebrate those special times in your life. Whether it is as simple as a birthday cake one night at dinner or a wedding in one of the many romantic ports of call, a cruise is a perfect way to celebrate! Your travel consultant can help you find the perfect package and way to celebrate your special day. Imagine the romance of the Caribbean islands. The smell of brilliant tropical flowers lingers in the air as the ocean breeze blows across your face. Steel drums play in the background as the love of your life looks deeply into your eyes. This isn't a dream… it could be your wedding day! Cruise lines will take care of everything for you! Your wedding is one of the most important events in your life, but it shouldn’t be one of the most stressful. One call and everything is arranged: the cake, the menu, the flowers, and the music. Each individual cruise line offers different packages that may include a ceremony onboard the ship or a ceremony in the many ports of call. Each has their own individual guidelines and regulations that they follow. The cruise line’s wedding coordinator can help with those important details so that everything is perfect for your wedding day. Celebrate your anniversary and your love with a vow renewal. Whether you renew at sea or at one of the many of the beautiful ports of the world, this will be an experience that you never forget. What better way to continue that promise of forever? The wedding coordinator can help you with the details. Each cruise line has their own special touches that they add. Some lines will perform the ceremonies complimentary while others charge for the service. The vowel renewals may be done as a group of couples or individually. Many of the cruise lines will also require a valid marriage license. There is no other vacation more romantic that a honeymoon at sea! Cuddle with that special someone watching the waves from your private veranda. Travel to exotic and romantic destinations. You may even get a few perks like a table for two at dinner or a wedding cake at dinner. Be sure to indulge in the romance or honeymoon package! Champagne, chocolate covered strawberries, breakfast in bed, or a couples’ massage are just some of the indulgences you can enjoy on your honeymoon! Whether it is your golden anniversary and you're celebrating with your entire family or it is just a quiet getaway for you and your spouse, celebrating an anniversary at sea is a great way to spark romance. Sip champagne under the stars with your significant other. Spend the evening dancing away in each other’s arms. Get up early to watch the beautiful sunrise over the serene ocean. 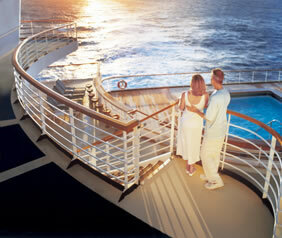 Many cruise lines offer romance packages to make this anniversary one that you will never forget!